This is a Document Based Question that is similar in style to the PARCC tests and aligns to the new 2020 Maryland High School Assessment ECR / Cluster Questions in its design. You need to examine the facts in this court case, including its common law development, making a ruling at the end and explaining your viewpoint. The Fourth Amendment protects individuals from unreasonable searches and seizures and requires two branches of government to agree in order for search warrants to be issued. But what happens when the police do not act within the law, and conduct searches without a warrant that are in violation of the 4th Amendment? Mapp was convicted under Ohio law for possessing "lewd, salasious, or obscene material." Mapp appealed her conviction. She based her claim on First Amendment grounds, saying that she had a right to possess the materials. When the case reached the Supreme Court, however, the Justices did not address her First Amendment claim. The Court instead overturned her conviction because the evidence against her had been seized without a warrant. ln so ruling, the Court applied the exclusionary rule to the states. Which piece of information from Source A supports the following claim: "The court overturned her conviction for being arrested for possession of lewd, salasious, or obscene material"
A. She based her claim on First Amendment grounds, saying that she had a right to possess the materials. 1. What are the major items that a person has protected against unreasonable government searches and seizures? 2. What conditions must exist for a warrant to be issued by the government to search an individuals property? Which analysis of Source B is the MOST accurate? 1. What types of items were taken in this court case? 2. Why should the conviction be reversed? 2. 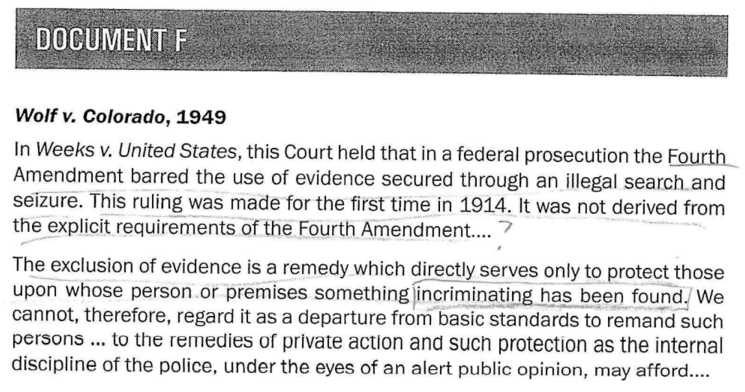 What "safeguards" are provided to the people in the 4th Amendment? D. they "letters" are used in evidence over his objections, prejudicial error is committed and the judgment [conviction] should be reversed. B. Property that includes personal items, houses, papers, and effects are protected against unreasonable searches and seizures. 1. How does the 4th Amendment support the idea of what we have previously covered regarding Zones of Privacy? Explain in 1-2 sentences. Examine this last portion of document F, why did the Court refuse to apply the exclusionary rule to states? In what circumstances would protection to be secure in their persons, houses, papers, and effects against unreasonable searches and seizures NOT exist? The Mapp family was found in possession of items that were classified as illegal to possess in the state. When a police officer stumbled upon them without a warrant in the Mapp family possession he arrested those individuals. Previous court rulings gave the state the right to perform this type of search and seizure without a warrant. The Mapp family took the issue through the court system arguing that their rights had been violated. The 4th Amendment has been deemed to not work when protecting people from unreasonable searches and seizures by their State government. What Amendment grants the right to privacy under the due process law? "In extending the substantive protections of due process to all constitutionally unreasonable searches-state or federal-it was logically and constitutionally necessary that the exclusion doctrine - an essential part of the right to privacy-be protected. [O]ur holding that the exclusionary rule is an essential part of both the Fourth and Fourteenth Amendments is not only the logical dictate of prior cases, but it also makes very good sense. 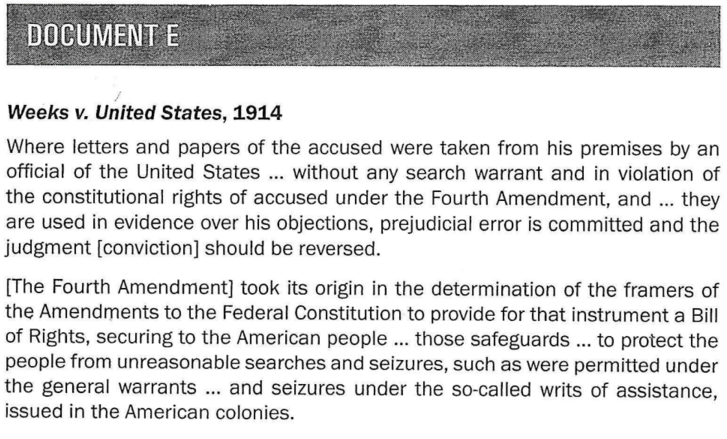 When the Fourth Amendment's ban against unreasonable searches and seizures is considered together with the Fifth Amendment's ban against compelled self-incrimination, a constitutional basis emerges which not only justifies but actually requires the exclusionary rule. Therefore, Mapp is to be set at liberty (free)"
Explain in 1-2 sentences, why did the Court apply the exclusionary rule to the states? Believes that this ruling undermines each State’s authority to be free to determine for themselves how to enforce their laws, and ensure social order in their borders. The dissenting opinion does not believe that States should have to follow the exclusionary rule as designed to stop the Federal (national) government from intruding on your personal lives. The Bill of Rights was designed to stop the Federal Government’s actions, not the state governments’ actions. Do you agree or disagree with the dissenting opinion's view of state's rights that the Bill of Rights applies only to the Federal (national) government? Explain why/why not in 2-3 sentences. The exclusionary rule remains controversial. Supporters say it ensures liberty and justice, while critics claim it actually threatens those values. Does the exclusionary rule ensure liberty and justice or does it actually threaten those values by not allowing State governments to protect their citizens?